Kalfayan Galleries are pleased to present the solo exhibition of Marianna Gioka (b. 1980, Athens) titled ‘A topography of the mind’. The exhibition at Kalfayan Galleries (11 Haritos Str., 106 75, Athens) opens on Thursday, 14 February 2019, 20.00-22.00. Moving from ‘Invisible Cities’ to ‘skyscapes’ Marianna Gioka aims to preserve the aura of sounds and colours. At the same time her paintings move from expressing aggressiveness of urban space to capturing the mystery of ‘mindscapes’. Mariana Gioka's work conveys the sequence and interweaving of time and space. Her abstract, linear drawings resemble shimmering mirages and betray her training in architectural drawing. Her intricate gestural paintings are constructed by multiple layers of oil paint that are overlaid with intricate drawing with India ink. Eiher working on a miniature scale, or in large scale as is the case of the 5 meters long painting exhibited in the show, the dense and complex compositions of Gioka with their restricted yet dynamic palette of colors reveal a strong concern with the human nature and human feelings; images of the human psyche, in a state of calmness, anxiety or excitement; portraits of feelings, unsolicited thoughts, unexpected fears. Therefore the works of Marianna Gioka can be understood as metaphors about the complex and intriguing nature of the human mind. In her “Invisible Cities” series, inspired by the omonymous novel of Italo Calvino, Gioka’s paintings conjured up the imaginary cities described by Marco Polo, the protagonist of Calvino’s book, to Kublai Khan. The detailed drawings with India ink on canvas focused on the inhabitants of urban centers, their sentiments and their movements in the cities. Gioka was intrigued to explore how the strange, magical landscapes and buildings merely conceal human activity. Having developed a highly personal artistic vocabulary, the artist remains loyal to her expressive media while continuing a more comprehensive research into the landscapes of the human mind. 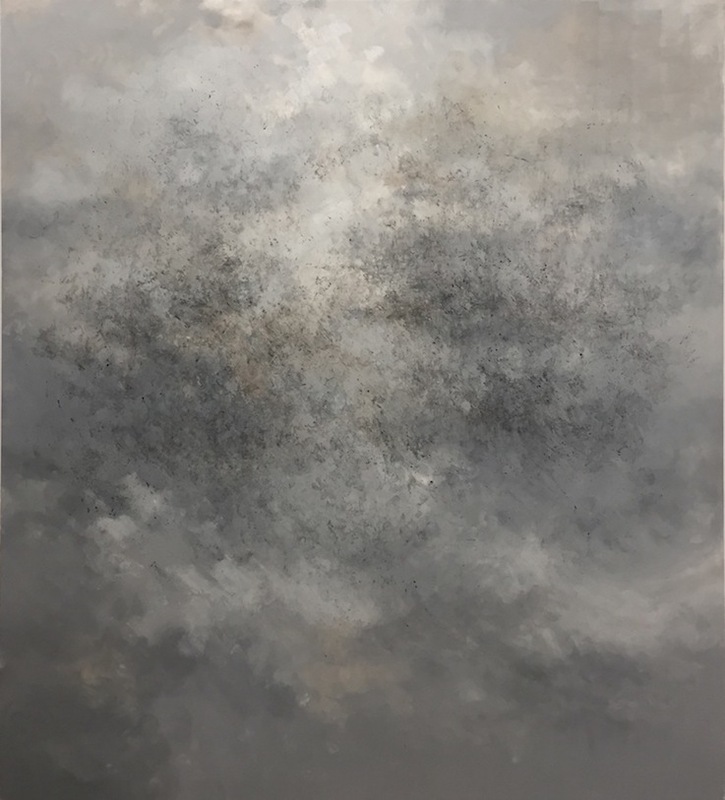 Drawing inspiration from the depiction of sky and clouds in Dutch and Italian painting of the 15th Century, the theatrical illumination provided by the clouds in the French Romantic artists such as Delacroix, the fascination of artists such as Constable with the observation of nature, Mariana Gioka creates skyscapes as symbolic systems of human brain and sensory activity. Capturing the gaze of the observer with their highly expressive brashstrokes, dramatic shades and fluxes of lines, Gioka’s paintings emit a strong, almost ‘cosmic’ magnetism. They achieve to nullify the boundaries between time and space, guiding the viewer through an oneiric exploration of the personal and/or collective subconscious. With her work Marianna Gioka composes a topography of the mind.